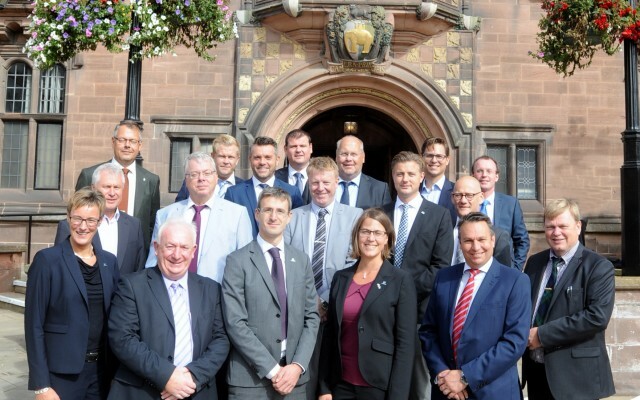 Techtank, technology cluster from Southern Sweden, has recently established its new international office in Coventry, a centre of automotive sector in the UK. Techtank announced the opening of its office during a reception in the Town Hall in Coventry on Friday 23rd September. Present were representatives of Swedish Embassy in London, civic leaders at Coventry City Council, LEP, Aston Martin, Jaguar Land Rover, London Taxi Company and EBS. Also members of Techtank in Sweden and the UK took part in the event. Techtank’s office in Coventry will be run by engineering consultant Paul Sullivan and his firm 52 Global Consulting, who has been continuously supporting the cluster and its members from the very beginning. Techtank’s move to Coventry has already attracted some member companies to the region, who are now looking to strengthen their UK presence, which could lead to substantial inward investment in Coventry and Warwickshire. Techtank member companies (BRODD Automation, EBP, Kockums Maskin, PE, Safeman, VA Automotive and Ytab), Business Sweden UK, Coventry & Warwickshire Growth Hub, 52 Global Consulting and Techtank representatives. Photo: Techtank. The potential of the region, a wide range of advanced manufacturing and automotive specialists based locally and long industrial tradition of Coventry and Warwickshire will continue to attract inward investors and clusters like Techtank to establish themselves here.